UK Entertainment Contracts & Forms. Lawyer Drafted. Entertainment Agreements for use in Film, Music Production, Events and Publishing. 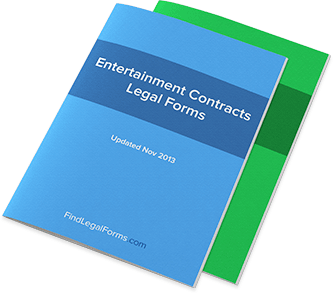 Entertainment Contracts & Forms to be used by those in the entertainment business. Included are agreements, licenses and contracts for use by actors, agents, writers and musicians. Forms related to the entertainment industry including synch and performance licenses, license agreement for home videos and numerous copyright assignment agreements. Event Sponsorship Agreement (England and Wales) This Event Sponsorship Agreement is designed for use in England and Wales. This legal form is available for immediate download. Event Combo Package (England and Wales) Get 9 forms for just $38.95. Save 52%! This Event Combo Package is designed for use in England and Wales. This combo package is available for immediate download. Entertainment Contracts are written agreements that apply to the fields of art, literature, television, movies, and the like. Typically, Entertainment Contracts refer to agreements between companies and individuals such as writers and directors; however, agreements in the entertainment industry can be as diverse as licensing agreements and nightclub or bar disclaimer statements. Because the entertainment industry as a whole constitutes a wide and diverse range of companies and entertainment outlets (for example, dance clubs could be considered entertainment venues), there is no single contract that defines the umbrella term of “Entertainment Contracts.” However, the distinction between Entertainment Contracts and contracts used in other industries is usually not too difficult to discern. What are some examples of different types of Entertainment Contracts? Though some might object and say that these types of contracts are too wide-ranging and diverse to be easily summarized, it’s worth looking at a few popular examples of these contracts in order to better understand what constitutes an entertainment contract. Licensing Agreement: This contract is one that focuses primarily on the business side of entertainment and not so much the creative side – even if it is creative work that is the subject of licensing negotiations. Because creative work is protected by copyright laws, it’s necessary to retrieve a licensing agreement from the owner of a copyright in order to use their work in some capacity. A Licensing Agreement is a prime example of a common Entertainment Contract because it demonstrates the power of intellectual property law, which is always a top consideration in the entertainment world. Actor Employment Agreement: Used for both union and non-union actors (though the different types of actors will require separate and distinct legal forms), this type of contract can be used for films and other types of work that will require the employment of an actor. Personal Appearance Contracts: Figures in the entertainment industry – and even some of those who are not in the same industry but still make paid personal appearances – will often look to negotiate strong Personal Appearance Contracts in order to ensure that they are adequately compensated and that the terms of their appearance are adequately met. These three, of course, are just a few examples from the wide-ranging categories all falling under the “Entertainment Contract” umbrella. What industries require the use of Entertainment Contracts? There are a lot of industries that will be able to find some use out of at least some entertainment contracts, from the core industries – film, television, publishing, etc. – to industries that only sometimes touch on entertainment, such as filming the occasional commercial which requires the hiring of actors. For that reason, just about any industry that does business on a large scale will likely require the use of an Entertainment Contract at some point. Additionally, even small, independent outlets (such as independent music labels and independent artists) will want to use Entertainment Contracts on a regular basis in order to ensure prompt payment and that business can be handled in writing. Can Entertainment Contracts be used to circumvent copyright protection? There is no way to circumvent copyright protection without violating the law, but it is possible to use copyrighted material with permission through the employment of the correct contracts. These include Licensing Agreements, Copyright Assignments and the like. As contracts, these agreements obviously require the consent of two or more parties – so there is no way to “circumvent” the issues surrounding copyrighted material. There are usually only two options for using copyrighted material: receiving permission to use it, and to use it illegally. Obviously, you’ll want to use the former strategy and not the latter. Are there any types of Entertainment Contracts which apply to more than one industry? There are a few that fit the bill. For example, a Synch & Performance License for Use of a Composition on a Soundtrack is an agreement used to license the rights to use a song for the soundtrack of a movie – this obviously merges both the film and music industries. Another example is the Merchandise Agreement, which can merge just about any genre of entertainment with the role of merchandising. I work in the entertainment industry, but my company is small. Do I still need to use Entertainment Contracts? Of course. In fact, the argument could be made that small and independent companies will need to rely more on these contracts to ensure that no business is lost because of conflicts with another party. What are the requirements for an Entertainment Contracts to be valid? Like all contracts, Entertainment Contracts require a few basic necessities in order to be considered valid in the justice system. For instance, signors must be of the age of consent or at least have parental supervision for the signing of the contract. Additionally, there has to be adequate consideration for both sides – that is, both sides must receive some sort of lawful value out of the agreement. This is in order to prevent contracts and agreements that actually border on illegal servitude rather than a legal exchange of goods and services. In the entertainment industry, there are additional requirements for a contract to be considered valid that may complicate issues in some cases – for example, if someone in a union signs a contract that is contrary to the union rules, there may be a chance that that contract is subsequently ruled to be invalid. Are Entertainment Contracts for live performances different? That would depend upon your way of defining “different.” Yes, there are separate contracts for in-person appearances – speeches, dramatic performances, live music shows – but that doesn’t mean these contracts are in some way inherently different from other contracts that exist in the entertainment industry. It is always the case that both parties should use a contract that fits their situation appropriately, whether or not they are used to a certain type of contract or not. This applies just as well to live performances. The good news is that there are plenty of available contracts to handle a wide range of these types of performances.